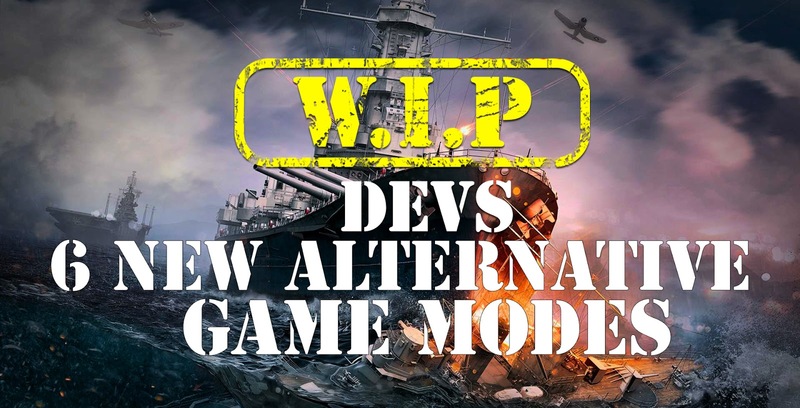 Several prototypes of new modes are coming to the test. Some of them will be updated and changed compared to the previous iteration. From the beginning of the battle a zone that becomes progressively smaller appears on the map. Inside this zone ships are constantly repaired, outside of it - constantly damaged. We already disclosed this one, but exact parameters have been tweaked a bit. In this scenario one team defends against the other. The defending team uses vehicles one or two tiers above the attackers. Defenders have repair zones, but attackers can re spawn after being destroyed. Defending team has to hold for 10 minutes and save the support ships. Attacking team needs to destroy all the defending vehicles and 5 "key" ships. Similar to the second mode, but players do not re spawn after losing their ships. Attackers need to push in particular directions and destroy repair zones and defenders need to prevent that. Either team needs to get 1000 points or destroy all the opposing vehicles. Each side has 3 forts, an airfield, repair base and 3 special ships, that have very high HP. Those ships move towards the enemy base and after reaching it start their attack. Airfields have numerous planes and groups are launched regularly. Victory is attained by either reaching 1000 points, making the enemy lose all of their points or destroying all the enemy vehicles. Most points are awarded for sinking enemy ships and destroying their buildings. Attackers and defenders on the Hotspot map. Defenders need to reach the base, activate it and a repair zone together with it. Attackers start from the other side of the map, and they're followed by a local weather event. Main objective is to take control of the inner defence line and hold it, receiving points for control. Battle is finished after one of the teams accumulates 1000 points or disposed of all the enemy ships. Defending team may win if the defence line is clear of enemies for 2 minutes, this requirement becomes active 5 minutes after the battle begins. Attacking team may win by capturing the defenders' base. Slightly modified mode where control areas spawn at the line of contact between the two teams. Control areas spawn at particular time intervals, and useful effects are activated once those areas are captured. If the number of ships from different teams is equal in an area, it is not activated until one team has more ships than the other in there. Increased main battery accuracy, Decreased detectability. Decreased reload time of main batteries and torpedoes. Please note, all that is stated above, are subject to change during the test. Nothing is final until published on each Regional World of Warships main websites.